Noteworthy reads, listed in alphabetical order. After living in Germany and deciding Prague was my favorite “walking city”, I thought it was high time I understood the tumultuous history of this capital city. Albright does a fair job of bringing 1000 years of history quickly to a head with the advent of The Great War and then WWII. She addresses why the country “Czechoslovakia” had any chance of unification with distinct nationalities (Czechs, Slovaks and Germans) living together and fleshes out the larger-than-life personality of TG Masaryk–who most likely, because of his charisma, was able to see potential and grow a basis of support from his countrymen. 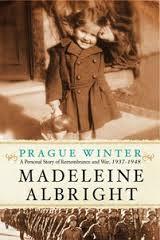 Albright’s father has a starring role in the book and it’s his job as foreign secretary that helps bring historical perspective to better understand the troubles Nazi Germany brought to leadership in Prague. As for Albright’s family being of Jewish heritage and her discovery of this late in life–the book doesn’t dwell; and that’s good. The book is best seen as a narrative of war and resistance to communism. I first picked up Sabbath as Resistance after reading a tweet from Shauna Niequist who mentioned that it was her selected in-flight reading. Since I’m a sucker for book recommendations from trusted readers, I bought the book. The author, Walter Brueggemann, is a respected scholar and patiently walks the reader through his understanding of Sabbath as a form of cultural resistance—specifically for the Israelites who said “NO” to the consumerism of the Pharaoh who commanded them to make bricks, without straw, no less. I appreciated his presentation of the 1st commandment “I am the Lord your God…” set against “You shall not covet,” the 10th Commandment. It was a nice way to frame this call to resist, or stop, the consumerism of our current culture and recognize that God, unique among all others, has set aside His people as a chosen people to worship, rest and renew our souls. Where I felt the book was lacking was in practical application of how to live into this new Sabbath understanding. It would have been immensely helpful to have the author present some scenarios to practice in our families and neighborhoods. Bruggemann does include a nice conclusion to his book which leads me to believe this might not be the final word he shares on this topic. 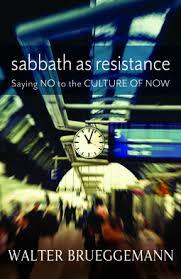 Perhaps there will be a “Part 2” addressing the practical nature of living Sabbath in the 21st Century. Until then, I’ll do my best to stop making bricks and let the soul catch up with the body. From the book: Sabbath looks back to the emancipating God of the exodus who delivered from the restless productivity of Pharaoh and who rests on the seventh day; And it looks forward to a possible neighborliness in which striving for commodity in community-destroying ways is prohibited. Sabbath is more than NO to pursuit and worship of commodity. It is YES to the neighborly reality of the community beloved by God. I got a strong start for the 2014 season about 2 weeks ago in mid-May. Temps in North Carolina went from damp and chilly 65 degrees to crazy hot 90’s seemingly overnight and something in me screamed, “Get to the library, now!” I returned with an overflowing stack of adult fiction and it’s been crazy fun getting acquainted with some new friends. 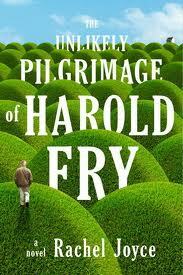 One of these happens to live within the pages of The Unlikely Pilgrimage of Harold Fry by Rachel Joyce. Harold, a sad sack of an Englishman, one day decides to skip the mailbox and walk his letter to the recipient. The story unfolds as he begins a 500-mile journey north to visit a friend dying of cancer. As expected, he meets a lot of interesting characters along the way and learns something new about himself. But where this book differs from so many others is in Harold’s recollections of past events and how those encounters have shaped his life. When his journey catches the attention of the British press, many would-be-pilgrims show up to join Harold on his walk. He yearns to remain independent and private but also wants to be seen as a good listener and perhaps provide others space to work through their personal issues. And then, there’s the matter of Maureen who remains at home, a strange and detached wife. Eventually, they reconnect during the walk and memories come flooding back. His hand passed her a bundled handkerchief, and Maureen nipped her face into its crumpled warmth. It smelled of him, and long ago. It was no good. The tears came. For me, the sum of the story hinges on this conversation. It’s not that we don’t change for fear of affecting the status quo—it’s that when we do take a bold step and move forward everything is different. Including those things that we choose to leave behind. And it begs the question: “How now will I live?” The book offers an unexpected twist near the end but doesn’t rely on cheap emotions to hook the reader. In that respect, it seems so very British to me.